The first vote on the Education Bill was passed comfortably by 458 votes to 115. 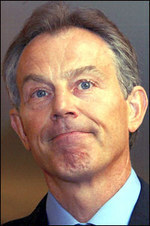 Labour says 51 of its backbenchers rebelled, so it was the Conservative Party "wot won it" for Tony Blair. There has been a lot of commentary about this Bill being the beginning of the end for Blair. His demise will quicken that little bit more if there is prolonged scrutiny after the second vote. See the key points of the bill, and the key quotes from the debate for more info. Yet we lost the programme motion so Cameron gets a slap to the face too. Can a party not in Government really lose motions in the sense you mean James? We get our MPs to vote in the way we want. Cameron can't do much more. I wrote a piece on "Your Platform" about this last year and it gives me little pleasure to see my predictions that this would descend into a farce have in-fact materialised. It is unsurprising that so many are disaffected with this Government and politics in general. It does however underline the flaw with New Labour, underneath all the talk and business suits, what is best for kids comes a dismal second to their cherished egalitarian dogma. Tony Blair's version goes something like this: Firstly he comes up with a proposal that the opposition like and his own back benchers don't. If the opposition don't take the bait, they are exposed as hopelessly compromised. If they get on board, the trap is sprung. Concessions are made again and again to Labour back-benchers until the frog is at boiling point, the PM literally cooks us with everyone else looking on. Cameron did try to stop this happening to be fair, notably with his frequent taunts on PMQs. Yes Oberon - 'what is best for kids comes a dismal second to their cherished egalitarian dogma' and one can add to that -what is best for anything else they have control over is affected in the same way by the same dogma. David Cameron understands one thing which is that in a sense the headline is the key sentence. Most of his target audience will not get bogged down in the detail of the arguments. They will see Blair wins vote only with the help of Tories. It shows that Labour is split. Job done! Well, without Tory support today's headline would have been: Yet Another Bill Fails--Blair Loses All Authority. And since this Bill is very, very far from ideal, that's exactly what the Conservatives should have done. There were some Tories who didnt vote against the Bill but instead didnt vote at all. Fair enough I guess. Ancram, Howard, Widdecombe, Winterton, Leigh and Forth amongst others. I think that Cameron is aiming to start civil war in the Labour Party rather than just trying to undermine Blair. It is far too early to say whether it works or not, but its an audacious plan. If it works, our chances of winning the next election are much higher. I agree Serf, and that would have been, and looked like a sound strategy until the announcement of the opposition to the programme motion, which led to calls of political opportunism in the Sun etc. Having lost that vote, it could be argued that the Labour rebels voted against on principle, but then rallied behind their leader to show a united party overall against a cheap stunt bt the Tories. Maybe not true, but it has muddied the waters enough for both sides to claim victory, in what should have been a clear Tory victory. The comments highlighting the difficulty Cameron has found himself in are fair. This all stems from the root problem with New Labour. The core rebels are Labour, about a third of whats left are opportunists who are trying to get Labour policies in through the back door and slight of hand (this includes Brown), an then there are this strange bunch in the centre who don't know whether they are coming or going - with President Blair at the helm trying to manage the whole circus. Surely we have it in us to beat this. It should not be the job of the Conservative Party to prop up a failing Labour Government, yet thjat is what Cameron made the Tories do yesterday! We should have defeated the Government yesterday, not voted with them. Any Labour Government is worse than (with the exception of Ted Heath's Government)even a bad Tory Government and we should be doing all we can to kill off this labour Government as soon as possible! Defeating Blair on this issue could have been painted as opportunism and would not necessarily have hastened the end of his premiership. Governments have been defeated before and survived. Instead, because the vote was won with our support, we have Labour's Campaign Group saying that Blair has, in effect, resigned as leader of the Labour party. In itself that isn't too much of a problem for Blair but he must be worried about how his party will react. Cameron played his hand well in my opinion,it was a shame about the programme motion but I would disagree that the job is done. What we need to do now is hammer the Labour neanderthals who voted against this bill at every opportunity as people who put their ideology over the need to ensure that the children of England have a decent education.At the same time we should hammer Blair and Ruth Kelly for their weakness and refusal to stand up to these people and the grubby compromises they were forced to offer at the last minute. Blair and Kelly started the education debate with two options, either a good bill with a backbench rebellion or no rebellion but a weakened bill. In traditional Nu Labour style they chose a “Third Way”, a weakened bill and a backbench rebellion. I would agree with the way Cameron played this. As he said himself during the hustings, he does not want to go into the lobbies with dinosaurs like Skinner just to put one over on Blair. If a Government measure will deliver even a modest improvement we should back it, but question their ambition and ability to deliver and attack Blair's willingness to sacrifice his own principles to placate the old left. The line about wishing he had gone further with every reform was an absolute gift to Cameron, it wouldn't surprise me to hear it in just about every PMQ. When in doubt, defeat the government. The thing people most hate in a leader is weakness. A defeat in the Commons for Blair would have been much more damaging, and we now have to carry some responsibilty for how these reforms are implemented. Our agreement to these measures will come back to haunt us. I have no doubt that these rebels will toe the line when Brown is in power, and this rebellion will be forgotten, but our support will not. "It should not be the job of the Conservative Party to prop up a failing Labour Government, yet thjat is what Cameron made the Tories do yesterday! We should have defeated the Government yesterday, not voted with them." The importance of education comes above party politics. This legisation, however flawed, was a step in the right direction. It was therefore right for the Tories to support it. Opposing legislation you agree with is irrational and would be painted darkly by the media. True Blue, I have to disagree, to defeat the government on this issue would have been counter-productive. Whilst many of the reforms are timid and do not go far enough we would be opening ourselves for a barrage of criticism for being inconsistent and opportunistic. As it is we look credible and measured rather than opposing for the sake of opposition. It is fair more impressive for us to be seen to give credit where it is due, measured criticism where it is appropriate and to show that we can put the interests of the country above 'Punch and Judy'. How could we possibly justify lining up with Skinner, Glenda Jackson et.al. to vote against a bill that will give at least some measure of independance to schools and allow non-state bodies to be able to open and run schools much easier? Because it would embarrass Tony? Do me a favour! How many of those Labour rebels would have voted against the Government if they knew DC was going to go through the no lobby? Do we know how many Scottish MPs abstained that might have turned up if the result was in doubt? If it was clear that the Tories were going to oppose the bill then the government would have made even more concessions to make damn sure they didn't lose the vote and we would have been left as the party that opposed education reform. "How could we possibly justify lining up with Skinner, Glenda Jackson et.al. to vote against a bill that will give at least some measure of independance to schools and allow non-state bodies to be able to open and run schools much easier?" Unfortunately, we're now lined up with Lord Hattersley - who believes this legislation now enables the government to kill off any form of academic selection.